Nokia Booklet 3G as location-aware netbook? One of the biggest issues with XP and Vista in the web2.0 world is that the operating system isn’t sensor-aware. GPS hardware remains as an unidentified com port and applications wanting to access it require user configuration. In Windows 7 that changes to make geo-aware apps a real possibility. It is possible that Nokia could deliver an interesting maps and social networking application through OVI on Windows 7. In addition to HD content, maybe Nokia will be selling navigation and maps through Ovi. Via Engadget, which reports "The Booklet will boast a 1.6GHz Intel Atom Z530, and will reportedly boast a 120GB HDD, plus integrated 3G, a swappable SIM card, A-GPS, Bluetooth and WiFi." Currently in Twitter there is a single location attached to a user's profile. There are ways you can declare location changes in a particular tweet, e.g. the l: syntax, a Twitter nanoformat, but these are only supported by a few tools, not by Twitter directly. The applications that I have seen with the most support for location information are smartphone Twitter clients, they typically have an icon to let you set your profile location to the current location (as determined by the phone), and some will let you do "nearby" searches based on your current location. Providing location information for web apps has been difficult in the past because there was no API to ask the web browser where it was, but now geolocation is supported in Firefox, Safari, in Google Gears, and on various platforms. This is being enabled by a standard W3C Geolocation API. Now Twitter has announced the rather more logical option of having a location attached to each tweet, rather than globally to your entire account. This is another step in adding more metadata attached to the raw 140 characters of a tweet. This will make possible lots of interesting tools, one obvious one being to display all of the tweets posted at a particular location. This does of course have privacy implications - and I hope that the system will provide per-tweet opt-in to sharing of location, rather than a global opt-out. We need systems that understand you may want different granularity of sharing depending on your location - a typical example is that you may want to share your exact location when you're at a pub downtown so that friends can meet you, but you may want to share only city-level location or no info at all when you're at home. There are already examples showing up of embedded location giving away rather more information than someone probably intended, such as a thief whose photo of stolen goods has embedded EXIF-GPS (via @jblyberg). Widely reported, e.g. PC World , New York Times , CNet. Image from Engadget WWDC 2009 coverage. Tethering is the use of your phone as a wireless modem to connect to the Internet from your computer. For a limited time, if you subscribe to a data option which includes at least 1GB of data transmission between June 8, 2009 and December 31, 2009, you may use tethering as part of the volume of data included in your option at no additional charge. Tethering cannot be used with data options of less than 1GB. UPDATE 2009-06-09: The tethering policy has disappeared from the bottom of the above page, but it does appear at the bottom of http://www.rogers.com/web/content/wireless-plans/iphone_smartphone_plans. This means the tethering policy should also apply to the Android phones. What we've said is that tethering will be included at no extra charge until at least the end of the year. I should also point out this note for those of you who may not have upgraded the OS in your Mac laptops... "NOTE: To use iPhone as a modem with a Mac computer, it must be running Mac OS X version 10.5.7 or later"
The new devices will be available on June 19th 2009. Is the new 6GB/$30 promotional plan available for all iPhone customers, new and existing? The $30/6GB will be available to all iPhone customers on both Rogers and Fido brands starting June 9th 2009.
iPhone OS 3.0 update (which is free for iPhones) will come out June 17, 2009. I asked Keith McArthur "does the $30/6GB plan last for the life of the contract (e.g. 3 years)?" and he answered simply "yes". and he said yes: "yes - any combination of voice and data"
As well I should mention that Rob Manne is also with Rogers and answers questions on Twitter. UPDATE 2009-06-16: Perhaps due to the high volume of requests in advance of the 3Gs, Keith has set up dedicated Rogers Twitter accounts: @RogersHelps, @RogersKeith and @RogersRob. Also here is the full set of "Tethering FAQs" from the iPhone 3G S page at Rogers. It's pretty clear they are going measure tethering use and then decide how much to charge. What is tethering or wireless modem? Tethering or wireless modem functionality is the use of your phone (such as your iPhone) as a wireless modem to connect to the internet from your computer. You can connect your phone to your computer through Bluetooth wireless technology or the USB cable provided with your handset. Can I tether on my iPhone? To use tethering or wireless modem functionality you require the new iPhone 3G S, or an iPhone 3G that has been upgraded with the new iPhone OS 3.0 software. Until December 31, 2009, if you have subscribed to a data plan which includes at least 1GB of data you may use tethering as part of the volume of data included in your plan at no additional charge. Tethering cannot be used with data plans of less then 1GB. Will data charges for tethering be free? No, tethering data usage will come out of your existing data bucket. When will I be able to tether on my iPhone? 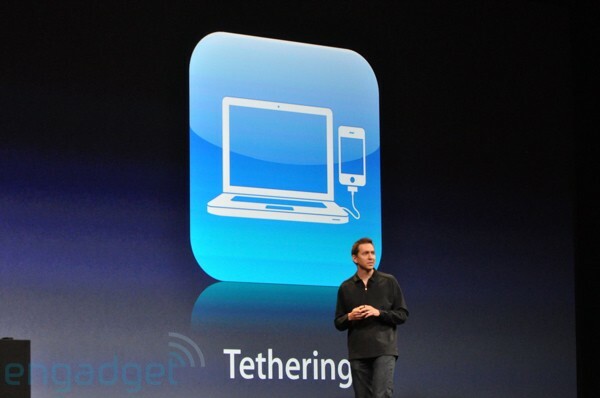 Customers with an iPhone 3G S will be able to tether right away. For customers with an iPhone 3G, who have upgraded to iPhone OS 3.0, we expect tethering to be fully operational for all iPhone customers shortly after the OS 3.0 release. What will happen on December 31, 2009 when the promotion expires? Rogers will continue to enable tethering on devices that allow it, but data plans will be adjusted to better reflect the way customers are using tethering services. by June 19th, 2009, Rogers systems will have been updated to make tethering fully operational for all eligible iPhone 3G customers. How do I tether on my iPhone? When I try to setup my phone for tethering by going through the following steps Settings-->General-->Network-->Set-up Internet Tethering, I get the following message “Set Up Internet Tethering. To enable tethering on this account contact Rogers”. What does this mean? This means that you don’t have the appropriate data plan on your account to support tethering, and require a data plan with at least 1GB worth of data for tethering to be enabled. Seems a rather odd choice of terminology. Modem, what's that? I'm guessing a fair number of 3G users have never even had a modem. Google Latitude is a primarily-cellphone service for sharing your current location with friends. As such it's quite similar to the services reviewed by Mathew Honan in Wired , as well as to Google's now-discontinued Dodgeball service. BrightKite and Yahoo's FireEagle also have aspects similar to this service, although FireEagle is more of a general infrastructure for exchanging location information. Latitude has quite broad cellphone platform support, with versions for Android (naturally), BlackBerry, Windown Mobile 5 and S60, with iPhone and J2ME support promised. There is also a web interface to the location info, as well as the cellphone applications. Of course, one can also speculate that knowing in great precision where users are could also help Google in shaping hyper-local search and advertising offerings. Latitude is not a separate service that people need to separately adopt and configure but an extension of existing Maps for Mobile functionality. People simply need to download the latest version of Maps for their phone and opt-in to location sharing. They also indicate that Latitude was an independent development from Dodgeball. UPDATE: In viewing the demo, there's no indication of a time, event, friend list subset, or proximity limit option on Latitude. I can see for example wanting to set various combinations of privacy limits - e.g. you can see my locations during the day, but not at night, or (a certain group of people) can see my location while I'm at a conference or other event, or some new contacts are allowed to see my location for a few days, but not afterwards, or you can only see my location IF you're in my friend list AND you're within a km of me. I also don't see the "location detail" options that Fire Eagle has (for example, I might be comfortable sharing that I am in a particular city, but not my exact location within that city). but I did very much like the idea of iNap, which uses GPS to detect when you are approaching your transit stop (aboveground, obviously) and wakes you up. I've fallen asleep on the bus and woke up many km west of my stop, and I always worry about falling asleep like that, so it's a cool idea. Location-aware shopping assistance (scan in a product code, get a display of nearby stores that have the item at a better price) is also an interesting idea, although I imagine it faces considerable database challenges particularly with small retailers. The second part of the cover story is an article by Mathew Honan where he used a bunch of GPS applications on a cellphone, mostly geopresence ("location streams" if you will). I wanted to know more about this new frontier, so I became a geo-guinea pig. My plan: Load every cool and interesting location-aware program I could find onto my iPhone and use them as often as possible. For a few weeks, whenever I arrived at a new place, I would announce it through multiple social geoapps. When going for a run, bike ride, or drive, I would record my trajectory and publish it online. I would let digital applications help me decide where to work, play, and eat. And I would seek out new people based on nothing but their proximity to me at any given moment. I would be totally open, exposing my location to the world just to see where it took me. I even added an Eye-Fi Wi-Fi card to my PowerShot digital camera so that all my photos could be geotagged and uploaded to the Web. He has some interesting thoughts about the implications of an "always on" geolocated world. The second page online also has an interesting comparison of cell tower vs. Wi-Fi vs. GPS location precision (albeit very rough, as there are many different variables that will affect position accuracy). The third page lists some GPS-capable cellphones, although it picks the Nokia N95 (which has some issues with GPS sensor position and sensitivity) rather than the N82 (which has a better-positioned GPS sensor, at the top of the phone - see e.g. comparison of N82 and Nokia P6000 GPS). Overall it's a reasonable exploration of Internet-connected GPS-enabled cellphone apps. As an aside, Wired really needs to add comment moderation / abuse reporting, there are some junk comments on its site. I think the article is timely, we will see more and more sophisticated applications (and associated privacy and social issues) as the number of cellphones with Internet, GPS and cameras increases. After a slow start, geotagging photos is becoming a standard feature on these cameras, and the combination of GPS and camera has recently gained more visibility with the announcement of iPhoto 09 support for geotagged photos. I've been tracking these developments in my blog, it's nice to see Wired continue to investigate the use and implications of these technologies. It would have been nice to have some mention of the other GPS options (automotive GPS, handheld GPS, GPS loggers and trackers) but I understand that from a consumer perspective the cellphone is likely to be a major GPS platform.